I'm looking to add to my fishing arsenal and I'm new to the Brown game. 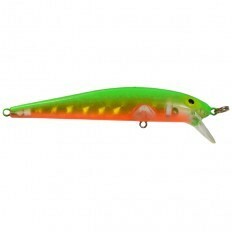 Can anyone suggest color, sizes, brands of stick and spoon baits.. THANKS!!! 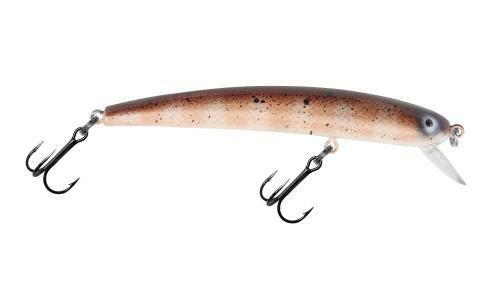 Many shallow diving stick baits take fish . 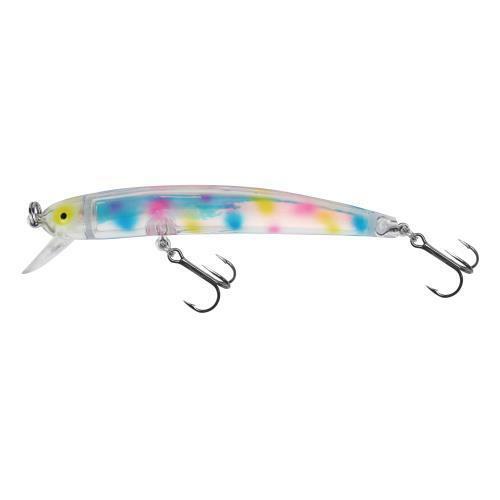 I run Bay Rat stick baits in My secret, Goby, BT Candy, High school & Yankee troller colors. Small spoons in multiple colors but uv mixed veggie is my favorite. 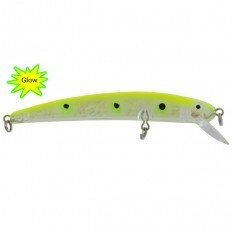 Go light line with fluoro leader. Get pattern spread wide running off planer boards for a quiet stealthy presentation. Good Luck! Really any stickbait can produce. As far as spoons go, same deal bright spoons for dingy water (spoons with a white back also work well in dirty water) and naturals for clear water applications. Regular sized stingers, DW Super Slims, Smaller warrior spoons, and others will work. Color choices are endless. Good luck with the spring browns. Thanks for the pics. dmd113. A question on the shallow running sticks. do you run the with mono or flouro and let the bill take them down to the running depth or do you run them with lead core or a sinker to get them down to the depth you want? I run heavier than most with 20 lbs big game as a mainline to a micro swivel to a 7 ft leader of 15 lbs floro. No leadcore or sinkers. With spoons I pinch a medium sized lead split shot 50 ft in front of the spoon. 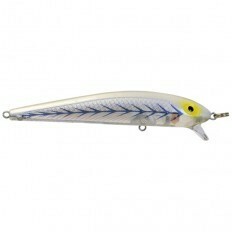 A black/gold F7 rapala. Jr thunderstick in fire tiger, mad flash fire tiger and chrome/black/orange. Those are my most consistent producers. Have you guys had any luck on the small scorpion stingers or all on the larger ones? I love the scorpion sized spoons for Brown's. I always ran one on one rigger and a small red eye on the other.
. With spoons I pinch a medium sized lead split shot 50 ft in front of the spoon. So what happens when you have a fish on and wind up to the split shot with another 50 feet of line out? Take the split shot off. Just like taking boards off with a fish on. We have always put the splitshot less than a rods length to the lure therefore you dont have to worry about taking it off and risk losing a fish. Split shot 3-6 ft up from the lure (depending on water clarity and what you are running)....also helps keep the grass and debris off the lure itself. Fifty ft back it is really not doing you any good keeping the lure down either and just something else to deal with on the way in. I absolutely love the scorpion size spoons for Browns!! If you watch some of Bill Saiff's video's on brown trout, you will see he is a Michigan spoon lover also, he used the medium size spoons, with a lot of luck!! To me I think he runs the medium size to eliminate the cookie cutter size trout for his clients. That's my take only!! Where I love to run spoons in the 2-3/8 inch HYBRID Lures and Michigan spoons run neck and neck for Browns. By all means don't forget about your stick baits, from older Rebels jointed, to the Smithwicks to Rapalas or your favorite buy 3 get one free bins. If you run a good stealth program you will be successful!! 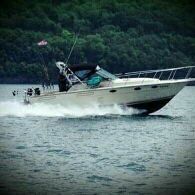 I personally think that being the stealthier boat will win the most Browns!! Those sound like Captain Bill Saiffe tactics, right there! The "weight rods" work! If you run the split shot too close to the spoon it kills the flutter action. And you are more likely to snag the bottom when your board stalls. Yeah I don't see the flutter changing. Flutter is not affected by the split shot. I run them 6 to 8 feet in front of the spoon down the chute and you can see the movement in the rod tip from the spoon. I will also run the split shot 50 to 60 foot in front of the spoon off the boards on my closest rod to the boat. I also don't use split shot when in shallow but do use them 5-6 feet in front of spoons and sticks in deeper water. Need to be careful letting spoons out or on turns if in shallow as they may snag. Does anybody ever run mag lips or kwik fish for brown trout? Go To Topic Listing Questions About Trout & Salmon Trolling?